The average cost of assisted living in Cody is $3,495 per month. This is higher than the national median of $3,345. To help you with your search, browse the 3 reviews below for assisted living facilities in Cody. On average, consumers rate assisted living in Cody 4.0 out of 5 stars. Caring.com has helped thousands of families find high-quality senior care. To speak with one of our Family Advisors about assisted living options and costs in Cody, call (855) 863-8283. Cody, Wyoming, sits in the northwestern part of the state amid a canyon and dry, flat territory near the entrance to Yellowstone National Park. The city honors its Wild West heritage of ranchers, pioneers and cowboys, such as Buffalo Bill Cody. The town's population of almost 10,000 people includes 7.5 percent aged 65 and older, and seniors in the town of Cody are served by two assisted living facilities. 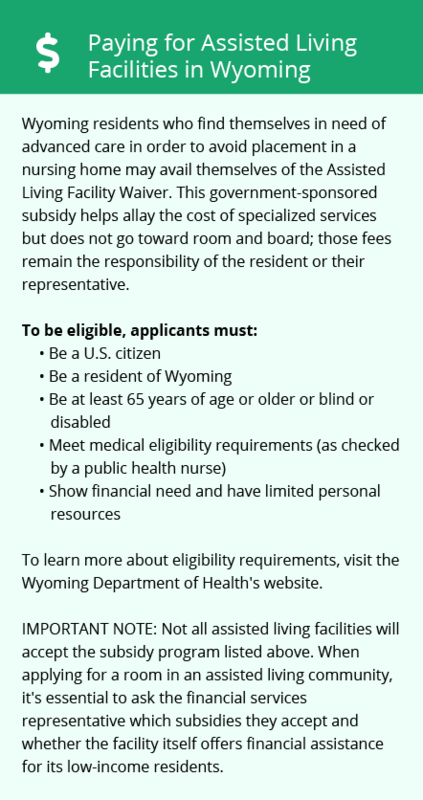 In Cody, and elsewhere in the state, assisted living facilities, are regulated by the Wyoming Department of Health. Cody has its fair share of sunshine, with 213 sunny days each year as compared to the U.S. average of 205. Combined with the very warm summer days, the city is great for seasonal outdoor activities. Seniors may not appreciate the heavy snowfalls each winter, though, due to mobility concerns. The cost of living in Cody is 10 percent higher than the national average, which may be a cause of concern for some seniors. Groceries, healthcare, transportation and housing are higher than normal, but utilities come in under the average. Seniors can benefit from lower tax rates in the city of Cody. There is no Income tax rate and the sales tax rate is only 4.0 percent, compared to the national rate of 6.0 percent. The city of Cody doesn't have a public transportation authority but there is a transit system that serves seniors available through the Cody Senior Center. The transit operates Monday through Friday with a half-price rate of one dollar each way for seniors. The Cody Senior Center operates as part of the Cody Council on Aging and provides life-enriching activities for people over the age of 60. Some of the center's activities for seniors include exercise classes, bingo, crafts, card games and pool. The city of Cody is served by a premier medical center, Cody Regional Health, in the event of illness or emergency. Assisted Living costs in Cody start around $3,495 per month on average, while the nationwide average cost of assisted living is $4,000 per month, according to the latest figures from Genworth’s Cost of Care Survey. It’s important to note that assisted living rates in Cody and the surrounding suburbs can vary widely based on factors such as location, the level of care needed, apartment size and the types of amenities offered at each community. In the state of Wyoming, assisted living financial assistance may be obtained through eldercare loans to help with expenses. Support may also be found through Medicaid and Medicaid Waivers. Learn more about these programs, plus who’s eligible, on our Assisted Living in Wyoming page. For more information about different ways to finance assisted living, visit our Assisted Living in Wyoming page. Cody and the surrounding area are home to numerous government agencies and non-profit organizations offering help for seniors searching for or currently residing in an assisted living community. These organizations can also provide assistance in a number of other eldercare services such as geriatric care management, elder law advice, estate planning, finding home care and health and wellness programs. To see a list of free assisted living resources in Cody, please visit our Assisted Living in Wyoming page. Cody-area assisted living communities must adhere to the comprehensive set of state laws and regulations that all assisted living communities in Wyoming are required to follow. 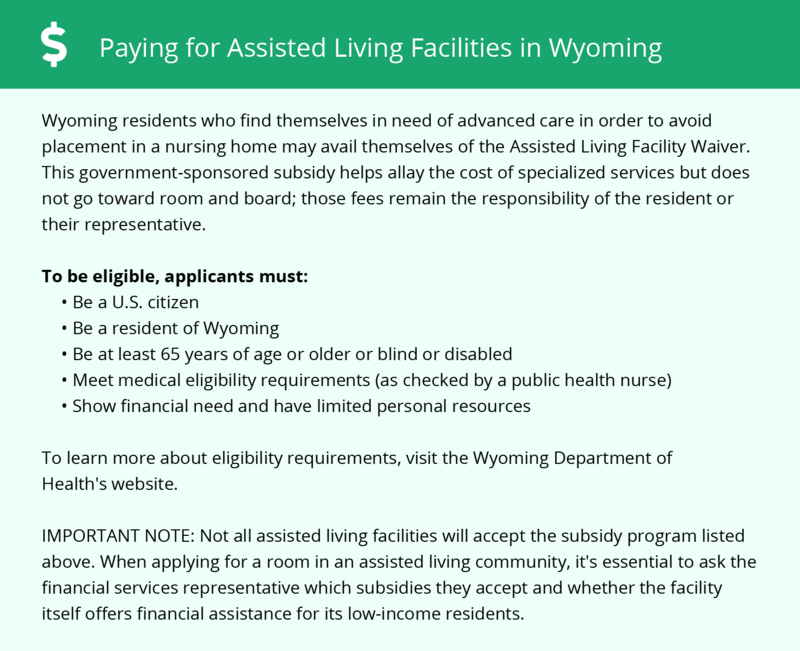 Visit our Assisted Living in Wyoming page for more information about these laws.